Neebe was born in New York and educated in Germany. He returned to the U.S. in 1864. During the depression years of the 1870's he worked numerous jobs in several cities, eventually becoming skilled as a tinsmith and as an artisan in precious metals. He married his first wife, Meta, in Philadelphia, and they moved to Chicago in 1877 where they had 3 children. Neebe found work at the Adam's Westlake Manufacturing Co., but was soon fired and blacklisted for having tried to organize his fellow workers. In 1881, Neebe established his own business, the Acme Yeast Company. He helped brewery workers organize, and for this activity, the big brewery owners considered him a dangerous man. 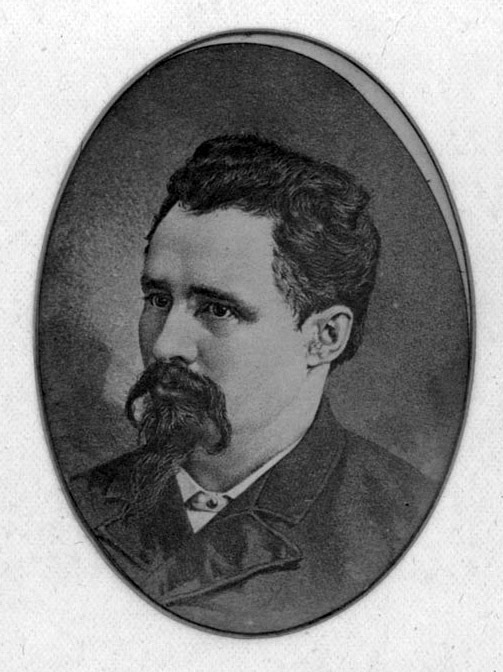 He supported the Socialist Publishing Co., publishers of the anarchist daily Arbeiter-Zeitung, and was active in Chicago Central Labor Union. 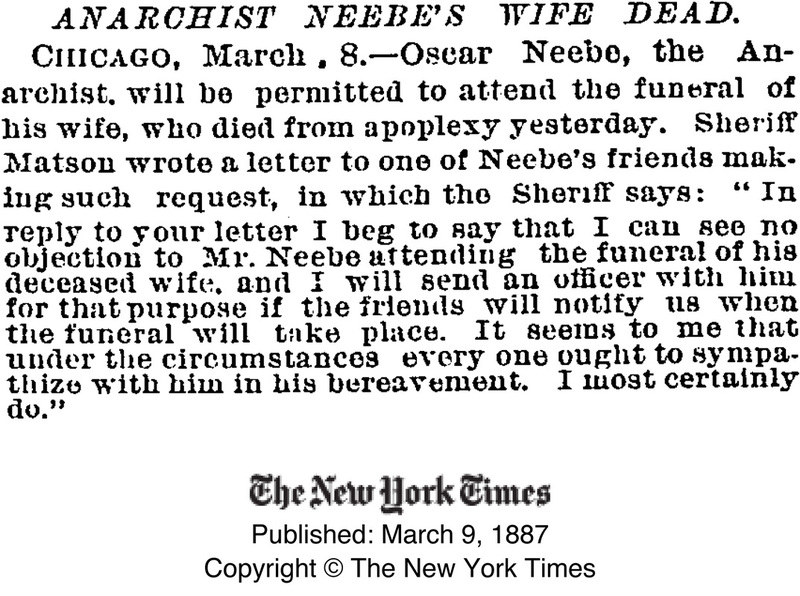 A member of the Haymarket Eight, Oscar Neebe was sentenced to 15 years imprisonment in Joliet, Illinois. He was pardoned by Governor Altgeld in 1893, after serving 6 years. Many say that Meta Neebe died "due to the stressful events" surrounding the trial and imprisonment. One year after he was released from prison he married Regina Hepp, widow of Charles Hepp. Meta Neebe, born Anna Meta Monsees was the first wife of Oscar Neebe, one of the Haymarket Eight. They were married in1873 and had 5 children. Meta died shortly after the trial and imprisonment of her husband. Many say her death was the result of her anguish over these stressful events--that she "died of a broken heart." 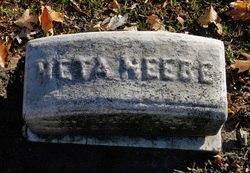 Meta Neebe was originally buried in another cemetery in Chicago and later moved to Forest Home Cemetery when Oscar Neebe was buried with the other Martyrs. The Chicago Tribune of March 13, 1887 reported that her funeral "called out more sympathy and excited more interest than any event that has occurred in the neighborhood since it was reclaimed from the prairie," and added that it was, indeed, "in some respects, the most notable funeral demonstration Chicago has ever seen." Also in the same lot are Martha Neebe ( - ), Fred Behrens ( -1900), William Behrens ( -1933), Nettie Neebe Beherns ( -1950), Charles M. Mueller( -1955), Phillip Mueller (1857-1895) and Edward Melville Mueller (1913-1955). Nettie Neebe married Wilhelm Beherns (4/11/1896) and Lillie Neebe married Charles Nitschke (2/14/1892). We would like to know additional information about the life of Meta Neebe and how these people are related.